This is historically the first of the Three Forms of Unity, having been composed in 1561. It is often called the Belgic Confession because it was written in the southern Lowlands, now known as Belgium. Its chief author was Guido de Bres, on of the several itinerant preachers during those days of persecution, who died a martyr’s death. Under Philip II, of Spain, an ally of the Romish Church, the Reformed believers in the Lowlands were sorely persecuted as revolutionaries. This Confession was written primarily as a testimony to the Spanish king to prove that the Reformed believers were not rebels, as was charged, but law-abiding citizens who professed only those doctrines which were the teachings of Holy Scripture. In 1562 a copy was sent to the Spanish king, accompanied by a petition for relief from persecution, in which the petitioners declared that they were ready to obey the government in all lawful things, although they would “offer their backs to stripes, their tongues to knives, their mouths to gags, and their whole bodies to fire,” rather than deny the truth of God’s Word. The Canons of Dordrecht, the third of our “Three For ms of Unity,” (Heidelberg Catechism, Belgic Confession of Faith, and The Canons of Dordt), are unique among our confessions in more than one respect. They are the only one of our confessions which was actually composed by an ecclesiastical assembly, the Great Synod of 1618-1619. Born out of internal controversy in the Reformed Churches of the Netherlands which was occasioned by the rise of the Arminian heresy, the Canons are the expression of the Synod’s judgment concerning the Five Points of the Remonstrance. This also explains the fact that the Canons are divided into five chapters, maintaining the truths of sovereign predestination, particular atonement, total depravity, irresistible grace, and perseverance of saints. Because the Canons are an answer to the Five Points of the Remonstrance, they set forth only certain aspects of the truth rather than the whole body of the truth, as do our other confessions. For this reason also the Canons are referred to in our Formula of Subscription as “the explanation of some points” of the doctrine contained in the Heidelberg Catechism and the Confession of Faith. There is attached to each chapter a Rejection of Errors, which refutes various specific errors taught by the Arminians, and does so on the basis of Scripture, so that in our Canons the truth is defined negatively as well as positively. The Canons represent a consensus of all the reformed churches of that day. For all the Reformed churches participated in the work of the Synod of Dordrecht; and when the Canons were completed, the foreign delegates as well as the Dutch delegates affirmed them by their signatures. 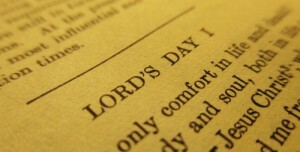 A service of thanksgiving to God followed upon the completion of the Canons, a service at which it was thankfully remembered that the Lord had preserved the Reformed Churches in the midst of a life-and-death conflict, and had preserved for the churches the truth that salvation is of the Lord alone. The Heidelberg Catechism was written in Heidelberg at the request of Elector Frederick III, ruler of the most influential German province, the Palatinate, from 1559 to 1576. This pious Christian prince commissioned Zacharius Ursinus, twenty-eight years of age and professor of theology at the Heidelberg University, and Caspar Olevianus, twenty-six years old and Frederick’s court preacher, to prepare a catechism for instructing the youth and for guiding pastors and teachers. Frederick obtained the advice and cooperation of the entire theological faculty in the preparation of the Catechism. The Heidelberg Catechism was adopted by a Synod in Heidelberg and published in German with a preface by Frederick III, dated January 19, 1563. A second and third German edition, each with some small additions, as well as a Latin translation were published in Heidelberg in the same year. The Catechism was soon divided into fifty-two sections so that a section of the Catechism could be explained to the churches in preaching each Sunday of the year. The great Synod of Dort (1618-1619) approved the Heidelberg Catechism, and it soon became the most ecumenical of the Reformed catechisms and confessions. The Catechism has been translated into all the European and many Asiatic and African languages and is the most widely used and most warmly praised catechism of the Reformation period.